Crazy Bastards Cross: THE CYCLOCROSS CHEF OF KNOWLEDGE AND RIDE TONIGHT AT 6! THE CYCLOCROSS CHEF OF KNOWLEDGE AND RIDE TONIGHT AT 6! 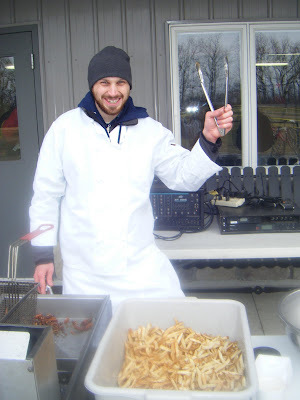 The Cyclocross Frites Chef is now symbolic for serving up things we've learned on a 'cross bike - or off of a cross bike. Today the Cyclocross Chef is serving up some things he learned at the State Championship race. While his main source of information didn't ride very fast, he did ride well enough to stay off the ground (for the most part), find the right line after the race was already decided and lost, and come away intact and functional without needed more pain-killers than usual, which is always good. Number one thing we pulled out of the deep fryer of 'cross knowledge: you need some of these in December! I take back every bad thing I have ever said about Fangos. I used them for two races, and while it may seem extravagant to have a set of wheels glued up for just two races, without them those could have been the most miserable days of the season. (The most miserable were the two days of racing in Louisville - something else we learned!) The little side knobs did an excellent job of holding onto the slippery side the hills we were forced onto again and again, and certainly gave me a level of control I could not have achieved with my beloved Grifos. The only place where I thought they could have been a little better was at the bottom of one off-camber where the mud was a little deeper. The center knobs could have been a little longer, and provided a little more bite - as it was they slipped a little, but not much. 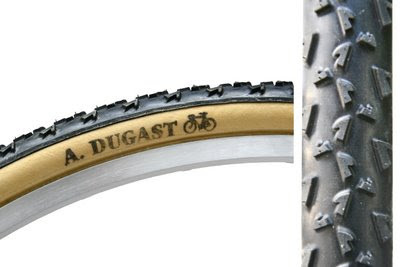 For the money, the quality and the wide range of uses, it's a great tire. If there had been snow over frozen ground, with the same off-camber course, they would have been damn near perfect. The tire that would have been perfect for Sunday looks something like this. No, it looks just like this. If you didn't recognized them from their profile, you should get it from this shot: Dugast Rhinos. While they would have been the perfect tire for Sunday, they really weren't. Turns out there were lots of these tires flatting on Sunday - and that's a damn expensive flat! We're talking about $120 buck a tire and a long run back to the pits (nice job Mike Seaman!). A few people were picking up "staples" for some reason - or maybe it was some of the rocky and rough sections. So while the tread is the best, with it's longer, deeper (ah, ah, ah, AHAAHAHA!) 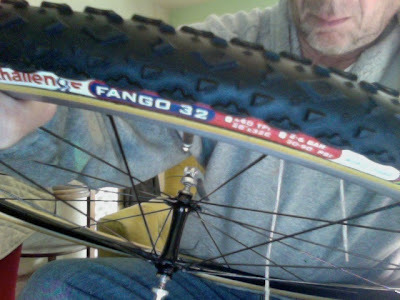 treads, and soft and cushy cotton casing ride, it's just not tough enough for me - or the Cyclocross Chef of Knowledge. The Fangos were the Chef's tire of choice for that kind of race. Tonight you won't need a mud tire, I thinking, though I haven't asked the Chef, yet. But you will need lights and something warm to wear. Looking forward to a little recovery ride and trip to the HC. It is the season. The Cyclocross Chef of Knowledge (I know I keep changing his title) leaves you with one last thing. A video of people who know how to ride in mud. Wish we had mud like this on Sunday. If we had, it would have been warmer, that's for sure. 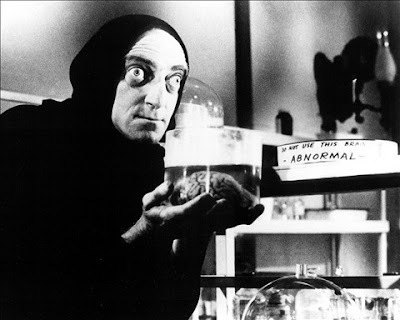 This is from last weekend in someplace called Igor Spain, which I think was a character in Young Frankenstein. Yeah, this guy. Guess his last name is Spain. Well enjoy the video, and see you, the Craziest Bastards of all, tonight! Still no photos from the race. As soon as they are posted I'll put them up and send them out to the riders that made it. Is the video blocking your view of the comments? Or is it just me? Year End Bloopers and Ride Tonight? NEED TO RIDE OFF CHRISTMAS! Thursday - Ride? No Ride? Lambchops? THE SUPER MASTERS OF THE FUTURE? HEY BABY IT'S GONNA BE COLD OUTSIDE, YEAH BABY!